Jessica Desire. An odd light wine shade with a creme finish. Jessica Flirtation. A medium dusty tea rose color with a creme finish. Jessica Love Story. A light cantaloupe orange with a creamy jelly finish. Formula on all was good. Slightly thick in texture, but easy application. Just be careful about applying thin coats and the formula shouldn't give you any trouble. Perfect brushes. I did three coats of each and all were completely opaque in three. Somewhat long dry time. It's cool that they chose three very non-traditional colors for their 2012 bridal collection, but I can't say I really like any of them. Not much else to say about it! EDIT: Apparently these three Jessica shades are dupes of Chanel's Spring 2012 Le Vernis collection! I hadn't seen the Chanel collection, so thank you everyone for pointing it out! 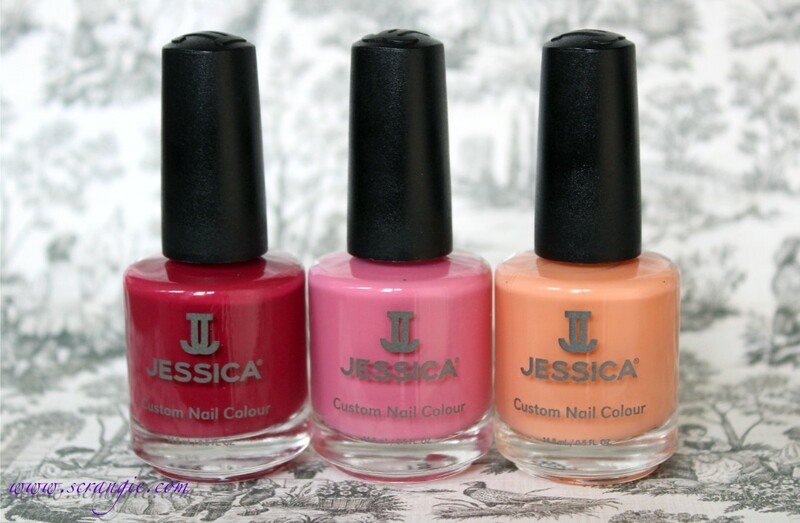 The Jessica Bliss is This collection is available in both regular polish and in GELeration Soak-Off Gel polish and can be purchased directly from Jessica Cosmetics. I think it's nice that they stepped out of the usual comfort box for this mini collection :) If I had to pick one it would be Jessica Desire! These look really similar to Chanel's summer collection (April/May/June)-is that just me? I think these are dupes to Chanel April, May and June. This really reminds me of the Chanel spring collection. Nevertheless, those are gorgeous colours. I love Love Story. Got a weak spot for peach nail polish. April, May, June? That's what it reminds me of. Pretty. OMG you guys, I had no idea. I just had to Google the Chanels and you're right! Another Chanel dupe collection! Glad I'm not the only one who immediately thought of the Chanel Spring Collection when I saw the first photo. I have been lemming April and June, so this is a good cheap alternative! This is fantastic! I've been drooling over those Chanel polishes, but I would never get enough use out of them for the price tag. I'm so excited for more affordable dupes! Beautiful colors and pics! 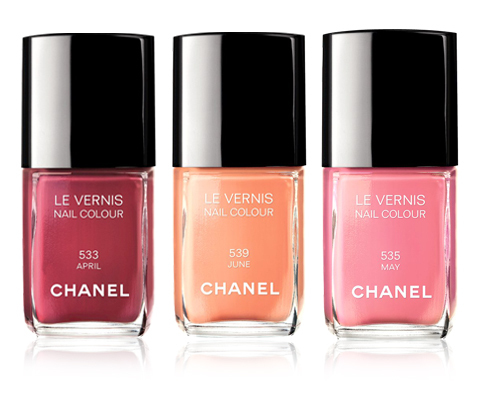 I'm glad to know these are dupes of the Chanel spring collection, love getting something similar for much less less! Yeah, I don't normally pay attention to Chanel releases so I hadn't even heard of this collection yet... oops! I really like flirt and love, but especially love. I have little respect in a company that will so blatantly dupe an entire collection of nail polishes. I mean, really, can't you come up with one original idea. Tell me I'm not the only one who feels this way. I agree, however Chanel prices are somewhat ridiculous and the formulas always wear off so quickly. Any idea when the collection releases? Well, I'd normally agree with you on that, but I personally love when companies release Chanel dupes, so in this instance I'm not upset. I never want to pay Chanel prices, especially with their below-average formula. I'm On the fence..Without companies duping many great colors of other polishes that are out of my reach or price zone is awesome for me and a lot of other girls. But I can also see were your coming from on this one..its like their almost too dependent on other companies to get themselves known and of course, more money. I'm all for originality, but with the way that Chanel keeps increasing their prices it makes me increasingly loathe to actually buy their polishes especially when the colors are relatively basic as these are. No respect either. Duping colors is one thing, but duping a collection......come on. Have a bit of originality. The colors are nice..but..I feel like I've seen them some were before in other collections or just at the drugstore. Its possible to even find dupes for Jessic's dupes of chanel. So for me, I wouldnt really have a strong desire to reach for these or feel like I need them in my current collection. Not knocking down dupes or anything,but I feel like theres a fine line between duping and just plain following another companies line. I mean TWO collections of chanel dupes already? Mmm kind of fishy Then again this will save us girls some money, plus companies do all the time anyways. I feel like every brand has been copying each other so much in the past few years, especially now with the spring collections that were released this year- so many dupes! But this takes it a step farther, an entire collection. Very original lol I understand the "need" of dupes, but they coul mix them in a bigger collection. Making exactly the same collection (again) it's like saying "we couldn't think of ANY good color" haha well, Chanel will always have its public, and so will the dupes! Haha yes, that is definitely true! While I like the fact that Jessica makes Chanel-Colors available (even when I think these are not special at all), I'm seriously disappointed that a company would do that in such an obvious manner and with 2 collections already. I dunno, just beats me how you can still be proud of you work if it's only blatant copy. If Jessica are going to dupe entire Chanel collection (again), why don't they do some old ones, which are hard to find. I also generally don't mind companies duping Chanel because who would mind some savings?! But it is kinda off-putting when a company dupes the entire collection versus one or two shades. Jessica did it for the Illusion d'Ombre fall collection, and now with April/May/June. Guess their strategy is to let Chanel do all the marketing and then release their version. That's very true. Not that I want any company to stop doing Chanel dupes, but I would prefer them to be honest/upfront about the fact that it's a collection of dupes (like what Revlon does with that "hottest runway shade of the season" thing they do) instead of pretending like it's a brand new collection that they created all by themselves. Awe, thank you :) That means a lot to me! There was a chance I would like these just because they are Chanel dupes, but I second Starlet's yawn. These are boring shades. Thanks for another informative post Scrangie! I love your pages. i really like the 3, especially together! i hadn't seen the chanel set before the jessicas, but now i don't even wanna buy the jessicas because it seems kind of skeevy in a way. i'm definitely not getting 3 chanels this season though so i guess i will just be living without haha.